What a difference a week makes eh? After an upbeat Diary that last week looked positively towards the future, this week’s offering is I’m afraid, a pretty downbeat affair. You see, quite frankly for me after last week, we went from a heartening showing to produce far and away our worst display of the season. It’s hard for me to write and I hate doing it, but I would challenge anyone who was there to find much that was positive from our showing, in what we will look back on as a scrappy and one dimensional performance. It might have been Comic Relief Night but for me there was little to smile about and our only relief came with the final hooter. In fact, it seemed a pretty universal point of view afterwards in the media and at the club, that we got exactly what we deserved!!! The Wildcats were far too good for us on Friday. They were well drilled, their game plan was good and executed brilliantly by all 17 players, whilst their half backs were allowed to dictate the speed and the flow of the game, simply because their forwards just bested our lot up front all night. We simply never seemed to be able to change the pace of the game. For me, we were totally out manoeuvred on a night when, once it became apparent that Chris Chester and Co. had rumbled us, no-one in black and white looked to have a plan B.
It’s never easy to criticise the team you love, but, as Lee Radford observed afterwards, the lack of atmosphere was palpable, as we all sat there almost bored to distraction by what we were watching. It was only for a short period when Litten was on the field, that we looked anything like lively. For the most part we lacked any sort of fizz or urgency, as all the while the opposition completely dictated the momentum of the game. As for the week’s other big news about the arrival of Andre Savelio, well I didn’t see that coming did you? The speed that the deal was done must have helped keep it under wraps, because after Andre was told by Brisbane Bronco’s that he would be released, it was only 48 hours before it was all done and dusted. The media over in Lancashire announced that Wigan, Salford, Rovers and Huddersfield had also shown an interest in a player who played for England at both the under 16 and Under 18 levels. However, we had been in touch with his agent for months about getting first chance at a deal, should he want to return to this country. Lee in fact said that he was regularly discussed at the club’s monthly recruitment meetings and well done to them for getting him, for I think with a bit of luck he’ll be a great signing. Mind you, judging by Friday, it looks like we can do with all the help we can get. That was some victory wasn’t it!! Can you believe it? I’m still struggling to grasp it all!! I simply can’t remember so many tries being scored by the FC without the opposition putting a hand on the ball. And good tries at that!!! All worth the admission money alone as was the sight, with 15 minutes to go, of the Leeds fans all ….. In that first half I wondered why I ever bothered buying a seat for all that money, because I was stood up for most of it!!! If all the accolades are piled on that domineering and totally authoritative 30 minutes in the first half, then the second half defensive showing was equally impressive. I’ll grant you, we missed a lot of tackles, but our willingness to work for each other shone through and from being 10-0 up after only a few minutes the Rhino’s weren’t allowed to score a single point for the rest of the game, whilst we scored 34! Since last June, at so many games at the KCom, we have sat there in silence, downhearted at what we were witnessing. We were certainly all silenced again on Friday, but it was stunned disbelief this time around, for we all sat there pretty incredulous as to what we were seeing. I guess looking back, it was just too much to take in! I can’t remember seeing a better 20 minutes of rugby from an FC side for years. It was simply imperious stuff and for once, writing this in the early hours of Saturday morning, I find it hard to do justice to just how good we were in that spell. Even watching it back its hard to appreciate the spring, verve and ruthlessness there was across the team in that period. Leeds are a shadow of their former selves, we all know that, but they still held a hoodoo over us that has, even for the best FC teams, been difficult to overcome. Not this time though! The purists will say that it was not as good a performance as I am about to make out, but who cares, after all those defeats at home on the trot, whichever way you look at it, for any FC fan that was a bloody wonderful victory! Two on the trot …. Boy that feels much better!!!!! It was in the end, great stuff again! Its almost two years since we registered back to back away wins and on a wet West Yorkshire Sunday, we were rugged and passionate and even a tad clinical at times. In addition to keep any Super League team to just one try on their own ground, is a fine effort as well. The Giants ain’t the best team around, it wasn’t pretty and it wasn’t totally convincing, but it was the win we needed and now with 2 from 4, things look a darn sight better than they did just three weeks ago. On what was a difficult playing surface in Huddersfield, we squandered possession and were at times ineffective in that first half. Line breaks for either side were at a premium, but Huddersfield looked like they really wanted it. That said, we were potent in the third quarter and clinical in the last one! It was an afternoon for heroes in the rain and there were none more heroic than Marc Sneyd. He should have gone off, but instead, with Jake off the field already, he hobbled along and masterminded the plays that in the end broke Huddersfield’s hearts. It was altogether a better week to be an FC fan though wasn’t it? That victory at Wigan Warriors last week has worked wonders chests were expanded, shoulders weren’t slouched and heads were held that little bit higher and that was just us lot the fans!!! It was a long time since we had all felt like that, but soon of course the psyche dictates that all our thoughts turned to this Sunday and whether we could do it all again! 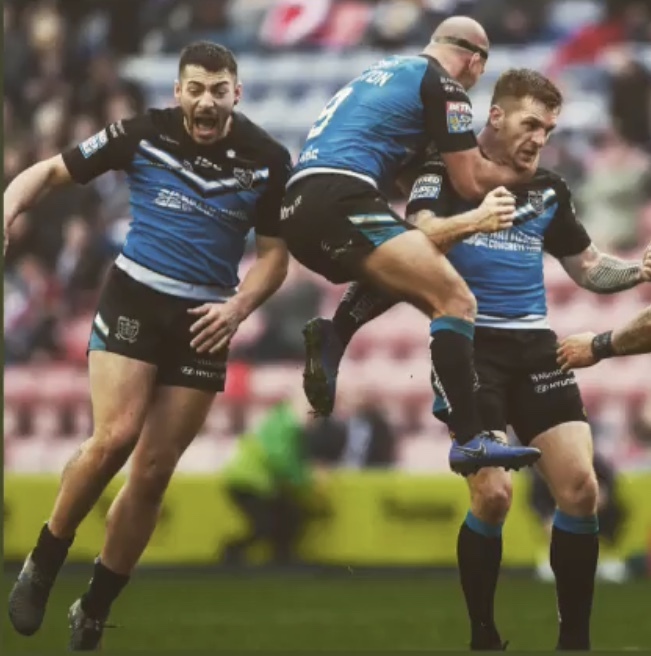 As the rain poured down and we fumbled our way through that first half you certainly wondered if Wigan was a flash in the pan, but you know, it was team spirit and another great will to win performance from everyone that finally got us home. You could see what it meant to them and the fans at the end, so well done to the boys! A great game, a great contest, a golden win and some much needed relief for us all. It’s been a while coming, but boy was it worth waiting for!!!!!! OK it’s only a win but I loved it!! All those 13 defeats on the trot and still we sell out our away allocation of tickets in advance and did those fans sing the FC home! What a golden Sunday it was, when instead of us going down in history for our longest ever run of defeats, we made history by winning the first ever game with a Golden Point. You really couldn’t make it up could you? 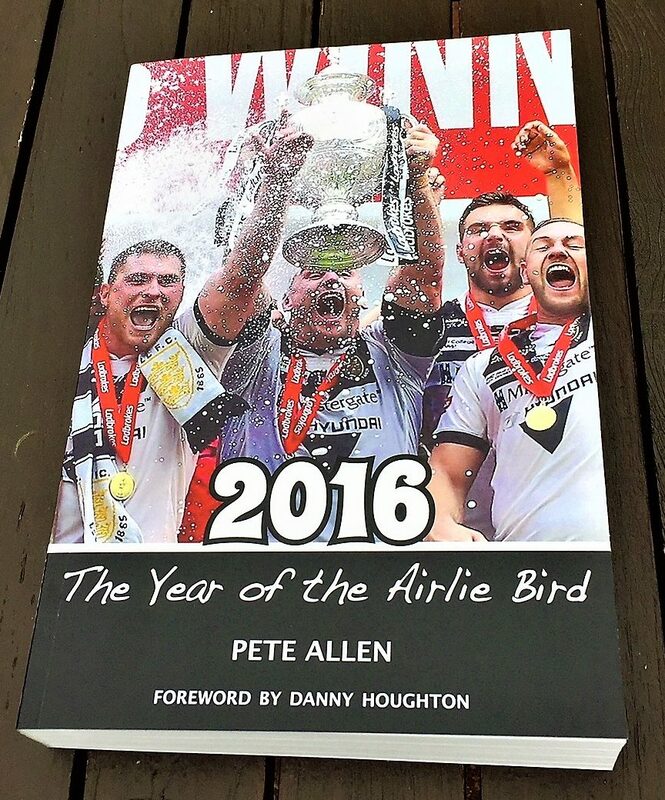 And who better to carry that accolade into the annals of our great game than Marc Sneyd! Behind in the first half, in front by 10 points twice, level at the end and then that moment of magic to add to all his others! To go to the Champions without a win under our belts and to do that must give us a massive fillip and boost both our confident and our self-assurance. We stayed together, we had grit, determination and incredible team spirit, then at last, after we had been so brave, fortune favoured us a bit and WE WON!!!!! It had a feeling of inevitability and ‘here we go again’ when Hardaker stepped up to attempt the winning conversion. BUT, it didn’t happen did it and we won as, ‘The Ice Man Commeth’ and did the business. We’d been down and almost out, but we grabbed the opportunity to complete what will always be remembered as a historic victory. So here goes with another of those up all night Diary’s!!!!!! As we pass the 16th Anniversary of our first game at the KCom, it’s almost been nice to have had a week off playing hasn’t it? In that passage of time so much has changed and yet so much has stayed the same in the tumble drier that is being an FC fan and so the drama continues, as does the unexpected and as ever, it’s not always good either is it? Already this season loads of stuff has gone on and been crammed in around those two defeats and all in the first fortnight of the FC 2019 campaign. Sadly, any dreams of a good start are in tatters and so this week its almost been a relief to catch our breath a bit and regroup our thoughts before we hit the road to Wigan next Sunday. It’s been one of those weeks that offers a time for reflection and looking forward and indeed for ensuring that as a club we do everything we can to avoid the escalating misfortune of another defeat this weekend. That would be an all-time record breaker, but we won’t dwell on that as with recovering players, a major suspension and our first Reserve game it’s been an interesting week off for us lot, as it has been for Scott Taylor who has another three off and poor old Matty Dawson-Jones who is done for the year!!! It’s therefore I feel, been one of the most incident packed and toughest starts to a season I can ever remember! In the end I guess the best team won but, as it happens and looking back, only just! Yet we are fast becoming the nearly team and that’s not good enough at all. We toiled and worked and tried and tried, but in simplistic terms we just can’t finish the opposition off and it’s now a question of how long can our lads come up short and yet still turn up so enthusiastically. In sport confidence is everything and ours has to be under stress. After 13 straight defeats, it plays on my mind, so it must do the same to the players. Only this weekend Jake Connor commented on the fact that he now faces two weeks of ‘being in a bad place’ after yet another reversal. I’m not one for predictions so early in the piece, but I do think it’s going to be a tough old campaign for our team. But, if we are honest, few of us really expected anything less did we? Attacking wise we have certainly improved, Connor, if we can keep him away from the disciplinary panel, is shaping up to be a ‘world beater’ and Westerman, if we can keep him away from the treatment table, is a big plus in the line as well. However, on the other side of things our pack, that once struck terror into even the biggest sets of forwards, seems to have lost a lot of it’s potency, they are getting older, looking too lightweight and failing to get the jump on their opposite numbers. Too many opposing players are in fact just allowed to stand in the tackle instead of being put on their backs and its stinging us big time. On Thursday the opposition ‘6’ ran through and even over us, because we just couldn’t slow the play the ball down to hold them when they rolled forward. Its tough for any FC fan to see our forwards bettered so easily by another team. We were certainly marched down field a full 80 yards on several occasions, just as we were at the death at Caravan Park. So, it’s frustrating, as the attack improves and the forwards go backwards. Unfortunately, and critically, having seen 6 Super League games now, I’m starting to think that every other team seems to have got better, rather than, like us, marked time. On that evidence I base my assumption that we are going to toil a bit in what is shaping up to be a long hard season. First up however somehow, somewhere, we have to get a win and although that’s easy to say, where it will come from is much more difficult to predict. Heart-breaking in the end? Yes, but passionate, valiant and packed with heaps of endeavour too; for we certainly had a go!! You can’t always win, but all the qualities we as fans ask for where there is abundance on Friday. It was a loss at the toughest of places to be defeated, but the hope of better things to come still burns on for another week at least. Rovers were playing at somewhere around their first choice roster, but we have much more to come. Despite a Derby loss to start the season off, with the heartbreak that brings, the depleted ranks that took to the field, played with pride in the fans and the badge and should be proud of themselves. We could ask no more as spectators, for it was a fine effort against all the odds and it almost came off! With only 8 tackles missed in the whole game it was a tenacious performance and when you take away the heartbreak of that finish, if we’re honest, it probably still ended up a lot better than any of us thought it would! But at least it’s out of the way and we escaped with our pride and credibility intact! You know, this week Jurgen Klopp said, “I can never ever enjoy being involved so closely with the Premiership title race”, probably I would guess, because he is so anxious, stressed and involved in it all and indeed in the weight of expectation it brings. And you know what? I get that completely, because I’m afraid these days, I can’t ever truly ‘enjoy’ a Derby game either and I doubt I ever will again! Perhaps once in the dim and distant past I used to be able to go along, enjoy the spectacle, revel in the occasion and appreciate it for what it was; just another game. However, just like Mr Klopp, for me that’s all changed. I can survive it, just about, and enjoy the result if we manage to win and if we lose, I’m disappointed, but strangely relieved that its all over as well! In fact, all my analogies of watching from behind the sofa or through my fingers, really are, for me, completely authentic and truth be known, most of the time I’d just rather not watch at all!! That said, I did watch and I have to say I was heartbroken at the end. However, that’s a feeling that only lasts as long as the circumstances that surround it, allow it to. Once I’d stepped back a bit, I realised we actually almost prevailed against all the odds, the heart and spirit was quite amazing and with a bit better discipline and a couple of creative players back to help the over-worked Sneyd, we would have won. So for this fan its onwards to Thursday!! !